The Studio boasts a selection of teachers with skills and knowledge from all styles of Belly Dance. We encourage you to enroll in as many different classes to help you find your preferred style and of course broaden your own dance knowledge. From Gypsy Caravan, ATS, Bollywood to Oriental; there is something for everyone! Hi I am Richelle, I started dancing at the tender age of 3, but it wasn’t until my late 30’s that I discovered bellydance! My dance passion is Gypsy Caravan Tribal Bellydance. It defines my lifestyle and is what gets me out of bed everyday with a spring in my step and a smile on my face. The attraction to Gypsy Caravan Tribal Bellydance® for me, is the feeling of connection with each and every dancer in our dance circle, dancing together improvisationally using a vocabulary of signature movements that feel so beautiful on your body, creating magic and allowing you “to be in the moment”. The wonderful sense of community it evokes, the divine feminine connection and the glorious costuming and musical choices we get to dance to. 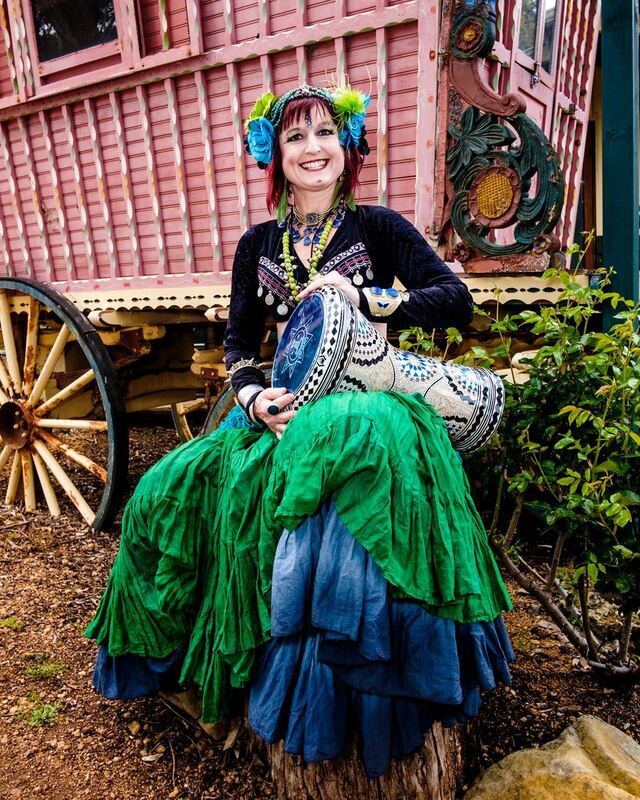 I regularly perform with my dance troupe, The Free Spirit Gypsies all over WA and beyond; I am the Director of Caravan Project Western Australia and a member of Gypsy Caravan Dance Company International. I have attained Collective Soul 1-3 and Teacher Training 1-2 and am a Tribal Grooves instructor, teaching as part of the Free Spirit Dance Community. I teach many different classes regularly including Beginners, intermediate to more advanced GCTB classes. Tribal Grooves which is like a tribal version of Zumba a fun, non stop dance movement class, a fun Bollywood workout class as I am a complete Bollyholic, love the music, the costuming, the colour, and the wonderful sense of fun and joy this dance portrays. If you love raqs sharqi, danse orientale, getting your spooky on or just boogieing on down to arabic music in a hip belt, you're in the right place! I am lucky enough to be very eclectic in my Bellydance loves, and dance everything from hot pink cabaret, to sassy shaabi, to tribal and tribal fusion, all the way through the glorious spectrum of dance to gothic bellydance. It DOES mean that my costume wardrobe has it's own postcode, but it means that you have a music suite and a repetoire for any event, any theme or any mood you need to express. I run two classes at the Mata Hari Studio on a Wednesday night. 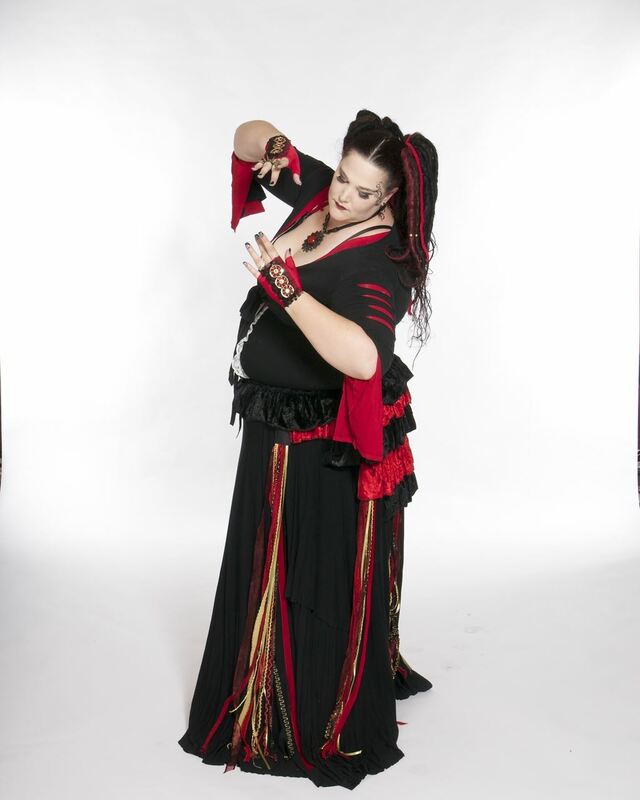 styles, props, rhythms and fashions throughout the bellydance world. We learn a choreography each term for performance and this class is suitable for intermediate students with some bellydance experience. 7.30pm class - BellySlink - a more challenging class for beyond-beginners. This is an improvised dance style called Elysium (created by Ma'isah of Melbourne) and is slower, slinkier and more muscular, so it's great for toning and strengthening your core. Slow things down and get slinky with it! Originally form Greek/Egyptian background Eva took her first Belly dance lesson with Belyssa Academy in 1990 and from that day ‘Dance Orientale’ became her passion and remains so to this day. She began teaching 26 years ago and still to this day loves to inspire committed dancers and is affectionately known as Eva the Diva by the dancers she coached and inspired. Eva has also attended many master classes in Perth, Sydney, Melbourne and Singapore, such as Hossam & Serena Ramsay, Ibrahim Farrah, Russya, Tito, Kaishe, Dr Mo Geddawi, Raqia Hassan, Momo Kadous, Randa Kamel, Aisha Ali, Suraya Hilal, Claire Naffah, Tereska, Liza Laziza, Beata and Horacio Cifuentes, Shareen el Safi, Kazafi, Leila Hadad, Mahmoud Reda, Yasmina Nour, Amera, Krissi and many more. Eva has conducted workshops in Australia, Singapore and Greece. In 2004 Eva performed in Greece for Count Naxos. In 2005 Eva was privileged to an impromptu performance for Hossam Ramzy’s family in Cairo. Both remain the most memorable performances of her career. Contact Eva at evabellydance@gmail.com or on 0412956354. Dahlia started her dance journey back in 1992 trained by Keti Sharif and performing in Keti’s 1 st troupe, The Sahara Bellydancers. In 1998 Dahlia successfully passed an audition with Belyssa, to attend a 10 day intensive in Teachers Training and in the same year started Jelly Belly’s in Mundaring, moving to Perth in 2000 to see her studio flourish for 12 years, teaching 6 classes a week to children and adults, with 3 performing troupes, kids, teens and adults. As well as training, all students, the school performed regularly in Festival, Fetes, School Fairs, Haflas, Perth Christmas Pagaent and at the annual concert. In 2009 Dahlia completed a weekend intensive in Sydney with Shemiran Ibrahim, Bellydancing from the Heart Method. In addition Dahlia has attended Festivals in Turkey, London, Sydney and our yearly WAMED. Dahlia has trained with the greats, Raqia Hassan, Farida Fahmy, Hossam & Serena Ramzy, Serkan, Dina, Mohamed Kazafy, Khaled Mahmoud and many other international, national and local teacher’s. Dahlia has been performing as a soloist since 1998 and was part of a Khaleegi Troupe, The Adani Dancers for 3 years. Since selling her studio space to Free Spirit Dance Community in 2012, Dahlia continued to teach till 2014, since then having a hiatus from dance to focus on her new family, playing the tabla and travelling. Dahlia is teaching a ladies beginners/progressive class on Saturdays from 9.30am till 10:30am. This class will split into 2 different levels. Children classes start on Saturday afternoons from 3:30 to 4:30pm. I started dancing at Applecross Tafe with Helen the Beautiful in 1998 (she is teaching the angels now) and from there I went on to learn from Eva, Ayesha and on to a lot of fantastic WAMED teachers. I started teaching about 16 years ago in the old Sheik to Sheik studio and have danced for the last few years with a small troupe of dedicated beautiful dancers who perform with me around the traps in retirement villages and other senior-friendly spaces. I run weekly daytime classes at the Mata Hari Dance Studio on a Wednesday and these are aimed at dancers who would like to continue dancing, but are finding it a bit challenging to keep up the pace. I offer gentler classes suited to seniors who have either danced before, or are interested in becoming part of a troupe who performs in the community and learning a repertoire of low impact, senior-suitable choreographies. This is a gentle, low cost class for those who want to keep their minds and hips agile and full of fun. If you don't use it, you'll lose it! My classes run at the Mata Hari Dance Studio in Bibra Lake on Wednesdays at 1.30pm. Classes are $5 each. Contact Dorothy on 0439 526 215. I have been teaching for over 12 years, with dance back ground from the age of 6, I am from the U.K.and have been here in Australia for 26 years. Dancing is my passion. I have performed overseas in troupes, and danced in many places, too many to write down. Also attending Master workshops here in WA and in Sydney, Greece, Singapore. I am passionate about teaching, and have been introduced to so many talented and interesting people. It has become so much a part of my life. Proud moments for me are to watch my students perform at concerts every 6-8 weeks. Belly dancing has a fantastic social life, it really does change your life, it changed mine.